**Please note the new location! When you attend the Academy School of Driving, you'll notice several things are different. The respect you receive from instructors and other students is automatic. There are no stupid questions. You will be expected to treat others in the same manner. Also, the atmosphere is low-key. 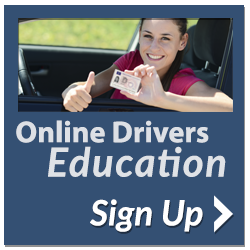 Nobody will yell at you for making inexperienced maneuvers (while behind the wheel). If safety is involved, your coach will correct the situation and use it as a "teaching moment". As a graduate of the Academy School of Driving, you'll take your place among other drivers on the public highways and back roads. Some of them will have been driving for decades while others are barely hours ahead of you. The main thing to remember is to DRIVE YOUR VEHICLE. No matter what else is happening either inside or outside your vehicle, your primary job is to safely move your vehicle over the road. Rubbernecking, cell phone use, makeup application, etc. are all distractions that can have serious consequences both for you and your passengers as well as others. We have some really cool cars for you to drive when you are ready for the behind the wheel driving portion of the course. All of our cars have a 5-star crash safety rating including a BMW 325i, Ford Escape, and a Mustang convertible.